Scientists from the New York Stem Cell Foundation (NYSCF) Research Institute have developed a new bone engineering technique called Segmental Additive Tissue Engineering (SATE). The technique, described in a paper published online in Scientific Reports, allows researchers to combine segments of bone engineered from stem cells to create large scale, personalized grafts that will enhance treatment for those suffering from bone disease or injury through regenerative medicine. "We are hopeful that SATE will one day be able to improve the lives of the millions of people suffering from bone injury due to trauma, cancer, osteoporosis, osteonecrosis, and other devastating conditions," says Susan L. Solomon, NYSCF CEO. "Our goal is to help these patients return to normal life, and by leveraging the power of regenerative medicine, SATE brings us one step closer to reaching that goal." Over a million individuals per year will suffer from a fracture due to bone disease, and as people age, their bones get weaker, leading to complications later in life. From traumatic injuries due to car accidents, domestic violence, and service in combat to genetic malformation resulting from diseases like osteogenesis imperfecta, the burden of bone deficiencies is massive and rapidly increasing. "Bone defects obtained in disease or injury are a growing issue, and having effective treatment options in place for personalized relief, no matter the severity of a patient's condition, is of critical importance," explains NYSCF - Ralph Lauren Senior Principal Investigator Giuseppe de Peppo, PhD, who led the study. Bone defects are currently treated with either synthetic substitutes or bone grafts taken from a bone bank or another part of the patient's body. However, these treatments often spark immune rejection, do not form connective tissue or vasculature needed for functional bone, and can be quickly outgrown by pediatric patients. Bone grafts generated from patient stem cells overcome such limitations, but it is difficult to bioengineer these grafts in the exact size and shape needed to treat large defects. "As the size of the defect that needs to be replaced gets larger, it becomes harder to reproducibly create a graft that can move from the lab to the clinic," says NYSCF researcher Dr. Martina Sladkova, the study's first author. "We wanted to see if we could instead engineer smaller segments of bone individually and then combine them to create a graft that overcomes the current limitations in the size and shape of a bone that can be grown in the lab." To explore this question, the team engineered a graft corresponding to a defect in the femur of a rabbit that affected about 30% of the bone's total volume. They first scanned the femur to assess the size and shape of the defect and generated a model of the graft. They then partitioned the model into smaller segments and created customized scaffolds for each. The team then placed these scaffolds, fitted with human induced pluripotent stem cell-derived mesodermal progenitor cells, into a bioreactor specially designed to accommodate bone grafts with a broad range of sizes. This bioreactor was able to ensure uniform development of tissue throughout the graft, something that existing versions of bioreactors often struggle to do. 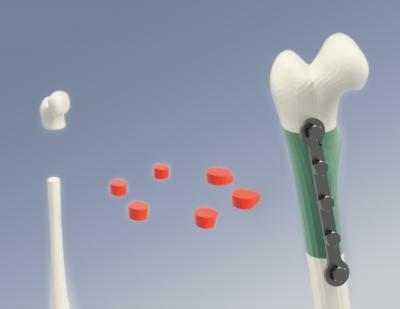 Once the cells integrated and grew within the scaffold, the segments of the bone graft could then be combined into a single, mechanically stable graft using biocompatible bone adhesives or other orthopedic device. SATE is standardized, versatile, and easy to implement, allowing for bioengineered bone grafts to more quickly make the leap from bench to bedside, and the researchers are confident in its potential to enable bone graft engineering that will help to improve the quality of life of pediatric and adult patients suffering from segmental bone defects. This article has been republished from materials provided by The New York Stem Cell Foundation. Note: material may have been edited for length and content. For further information, please contact the cited source.